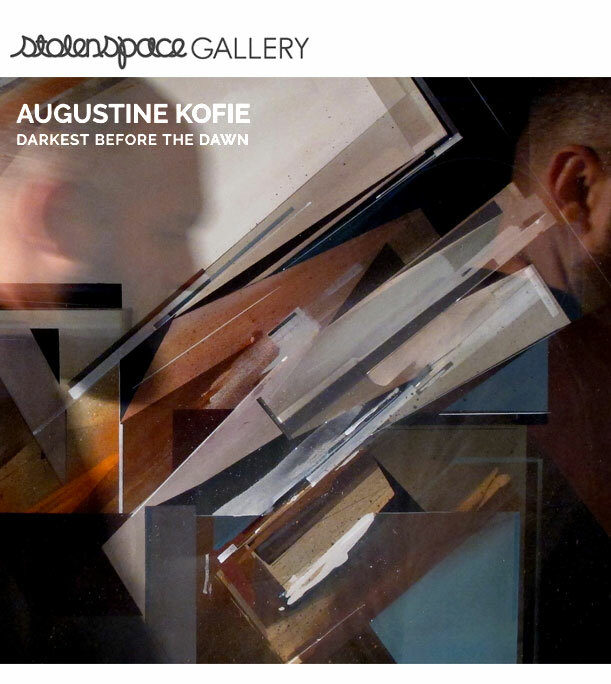 StolenSpace Gallery are excited to present ‘Darkest before the Dawn’ an exhibition of new work by Augustine Kofie. Email contact@stolenspace.com for press, previews and all inquiries. The first exterior mural intervention for the city of Ludwigshafen and the MURALU project. In conjunction with a future exhibition with the Wilhelm Hack Museum. Coordinators: Wilhelm Hack Museum, Ludwigshafen am Rhein and the WOW magazine for art and culture. MURALU: The Ludwigshafener Street Art project. An initiative of the Wilhelm Hack Museum and the WOW magazine for art and culture in Ludwigshafen. The large-scale Street Art project in Ludwigshafen, initiated by the Wilhelm Hack Museum and WOW magazine for art and culture in Ludwigshafen, will be launched at the end of 2018 and will continue to be developed until 2020. In addition to the involvement of regional and national Street Art artists, international greats of the scene are invited to Ludwigshafen to beautify the city. Conceptually, the Street Art project is integrated in an exhibition of the Wilhelm Hack Museum, which will be opened in the fall of 2020 and will examine the cultural, symbolic and material significance of the street in the context of artistic developments from the modern to the present day. This includes a detailed chapter on the history of graffiti in the 20th century. 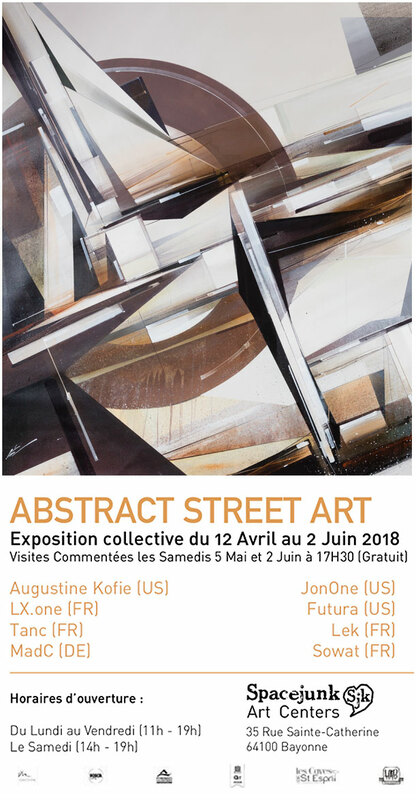 The street art project expands the exhibition into the public space of the city and builds on current developments in the urban art movement. The façade of a building on Ludwigshafen’s Luitpoldhafen presents itself in a completely new style with geometric, interlocking forms in soft orange and purple tones. 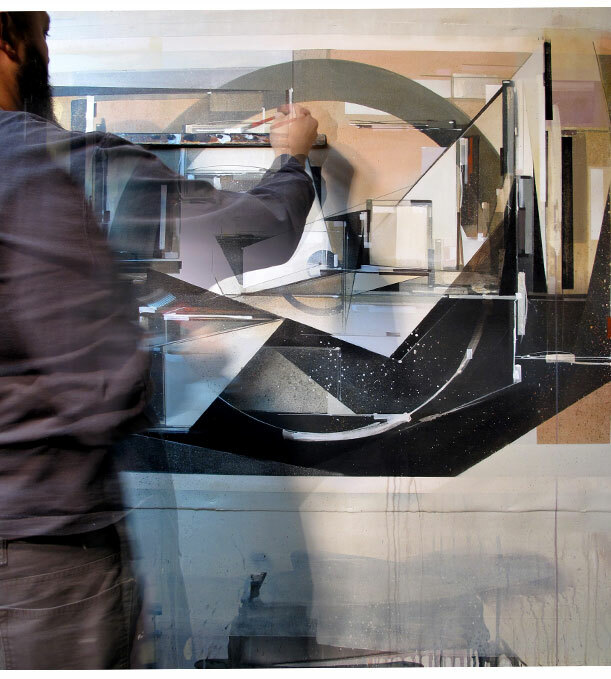 With façade paints and spray cans, the renowned American artist Augustine Kofie has designed the building in the dynamically abstract style since 16th of October, 2018, for which he is world-famous in the contemporary urban art scene. 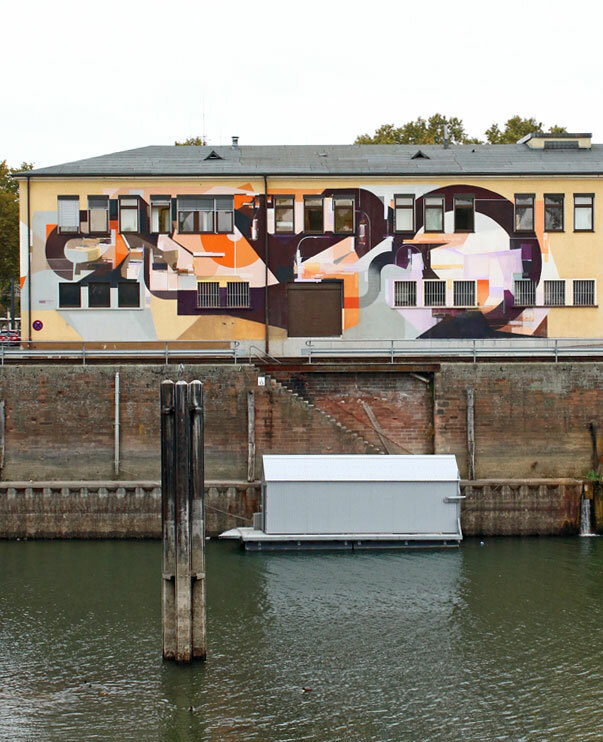 The Ludwigshafen work is the artist’s first permanent wall design in Germany. Graffiti by Los Angeles-born Kofie, whose works combine influences from street culture, art history and futuristic film design, can be seen in major cities such as Mexico DF, Boston, Marrakesh and London. The work on the corner of Rheinallee / Schwanthalerallee marks the beginning of the new Street Art project MURALU of the Wilhelm Hack Museum in cooperation with WOW Ludwigshafen. The project is part of an exhibition planned for 2020 in the Wilhelm Hack Museum on the importance of the street in art, including the history of graffiti in the 20th century. Until the opening of the exhibition, various buildings in the inner city of Ludwigshafen will be designed by national and international greats of the street art scene over the next two years. The implementation of the wall work of Augustine Kofie was supported by the Hafenbetriebe Ludwigshafen am Rhein GmbH, which has kindly provided the facade of the building, which is currently used by the Police Headquarters Rhineland-Palatinate. Details: Acrylic polymer on drywall. 100’w x 6’h. A comprehensive view of my collage, paintings and exhibitions, past and present. Keepdrafting has been the home of all of my creative exploits since 2001 an will remain so, but shall maintain a focus on public works and up to date projects. Found paper, acrylic, screen-print, ball point pen, graphite and white-out on cradled birch panel. Sealed in archival matte varnish. Finished in satin varnish. Not framed. 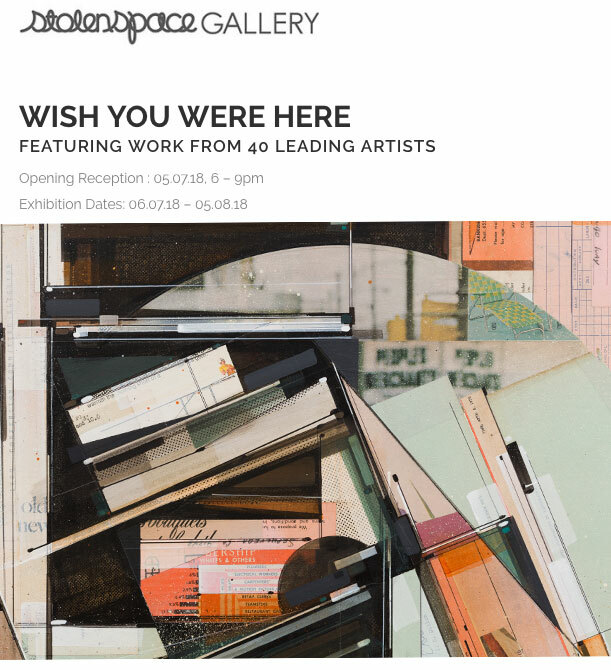 An eclectic showcase featuring original works from 40 leading urban contemporary artists, including D*Face, Shepard Fairey, Alexis Diaz, Herakut, Pichiavo and many, many more. Found paper, acrylic, screen-print, ball point pen and white-out on cradled birch panel. Finished in satin varnish. Framed by artist with found yardsticks. One of 3 recent works for the Matthew Namour Gallery spring group show from May 17 - June 17, 2018. Contact info@matthewnamour.com for all inquiries. Acrylic polymer and enamel on canavs. Adam Friedman, Aec Interesni Kazki, Augustine Kofie, Bohdan Burenko, Cain Caiser, Casey Cripe, Chazme, Chris Cycle, Damon Soule, Faith XLVII, Florian, Gilbert1, Jan Kalab, Justin Bower, Kenor, Lister, Low Bros, Mars1, Morten Andersen, Nawer, NoMe Edonna, Nychos, Okuda, Oliver Vernon, Optimist, Robert Proch, Rubin, SatOne, Sickboy, Thomas Canto, Tim Biskup, Tobias Kroeger, Vesod, Yoh Nagao, Zeser, Zepha. Mirus Gallery is excited to celebrate its Grand Opening, and inauguration of its new location in Denver. The gallery will open with a dynamic group exhibition featuring a variety of staple artists represented by the gallery over the years, as well as new international exhibitors who carry the gallery’s curatorial visions into the future. The opening reception is Friday, April 27th, 7-10pm. The exhibition is free and open to the public. 21+ ID Required. For the past 5 years, Mirus Gallery has been championing new movements of contemporary art in San Francisco and will now expand this vision to Denver. Mirus means “astonishing, extraordinary, and strange.” By definition, the curatorial direction of owner, Paul Hemming, presents just that through exhibitions of international emerging and mid-career artists. These exhibitions strive to engage viewers on a sentient, emotional and evocative level, while also pushing the boundaries in remarkable technical skills and process. By day, Zen Compound operates as Mirus Gallery, Hive Coffee Bar and as ECO-SYSTEM, a co-working space that also serves as an incubator for startups in which Hemming takes an interest. By night, Temple, an innovative club known for its entertainment programming, production feats and legendary hospitality, thumps as patrons provide the kinetic energy that lights up the dance floor. “Though each business is vastly different, the fundamentals behind each are the same: responsibility in all forms, to each other and our planet; constant evolution; and a drive to create something meaningful,” Hemming says. In 2017, Hemming is expanding with a new location in Denver. It will launch with a kickoff for a new Temple Nightclub in fall 2017 to coincide with the ten-year anniversary of the opening of the original San Francisco location. Two more domestic locations are in development now. Long-term, plans call for building Zen Compound into a nationally and internationally recognized brand. Zen Compound’s founder, Paul Hemming, has spent his life traveling between two worlds, born to a Chinese mother and American father. Hemming has built an eclectic business that reflects not only the duality in himself but also the yin and yang of Zen philosophy. 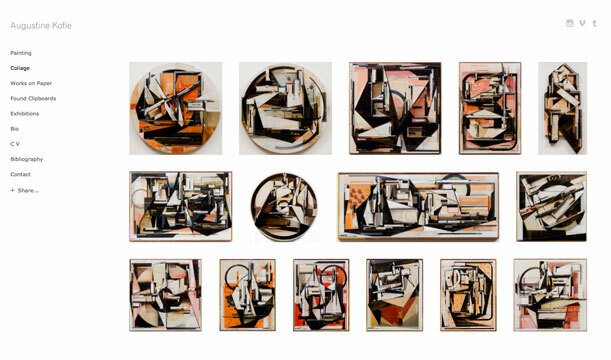 Art Poesia, has worked as an artist for over 2.5 decades in the San Francisco Bay Area and over the past 7 years curated multiple exhibitions internationally. 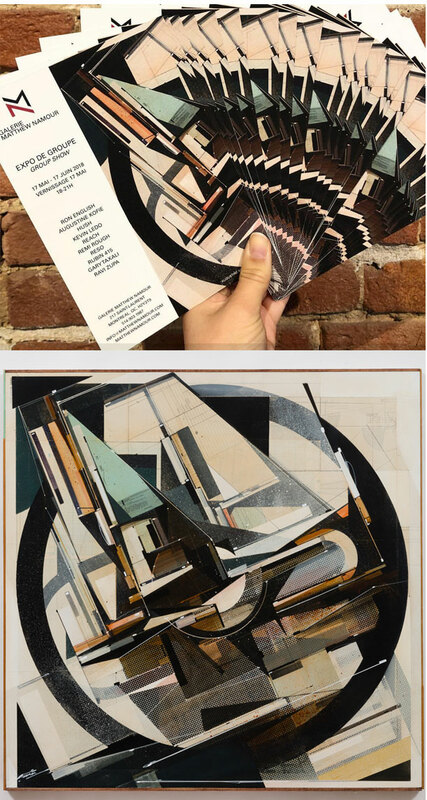 Having started the internationally recognized website Graffuturism.com as well as the Graffuturism Movement in 2010, he has now focused his attention to curating and bringing emerging artists to San Francisco, and now Denver. Mirus Gallery is the director’s newest project and venture into the commercial gallery space. A soundtrack created for the show by the artist is available on Mixcloud.com/4×4tracktor, and for only the second time in his career, as a physical, limited edition release on C60 cassette. 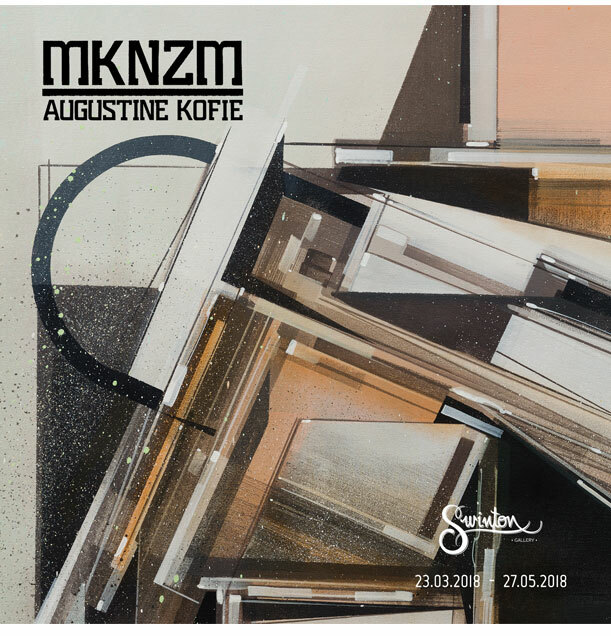 MKNZM Soundttrack available HERE to stream.